13 Hereford is located on the west side of Hereford, between Beacon and Marlborough, with 11 Hereford to the north, across Alley 414, and 15 Hereford to the south. 13 Hereford was built in 1872-1873, one of four contiguous houses (13-15-17 Hereford and 363 Marlborough). 13-15-17 Hereford were numbered 1-3-5 Hereford through about 1879. Click here for an index to the deeds for 13 Hereford, click here for a plan of the original land, and click here for further information on the land on the north side of Marlborough between Hereford and Massachusetts Avenue. Silas Merrill purchased the lot for 13 Hereford on October 1, 1872, and sold it and the newly constructed house on February 19, 1874, to Marion R. (Steedman) Morse, the wife of banker and broker Eben Rollins Morse. They had married in May of 1873 and lived at 241 Beacon. 13 Hereford became the home Marion Morse’s parents, Rear Admiral Charles Steedman and Sarah (Bishop) Steedman. Rear Admiral Steedman had commanded the Boston Navy Yard from 1869 to 1872 and the South Pacific Squadron from October of 1872 until September of 1873, when he retired. The Steedman family had lived in Philadelphia during his last tour of duty. The Steedmans continued to live at 13 Hereford until about 1877, when Charles Steedman made an extended trip to Egypt and the Holy Land. While he was away, Sarah Steedman and their daughter, Rosa, probably lived with one of the Steedman’s married daughters. After Admiral Steedman’s return, they iived at 302 Marlborough during the 1879-1880 and 1880-1881 winter seasons, and then moved to Washington DC. After the Steedmans moved from 13 Hereford, Marion Morse continued to own the house and lease it to others. During the 1877-1878 winter season, 13 Hereford was the home of Richard Morrell Staigg, a portrait painter, and his wife, Anna (Atkinson) Staigg. They also maintained a home in Newport. By 1879, they had moved to a new home they had built at 320 Beacon. During the 1878-1879 winter season, 13 Hereford was the home of Charles Franklin Garrigues, a dealer in dye stuffs, and his wife, Irene (Hibbler) Garrigues. They previously had lived in Philadelphia. By 1880, they lived at the Hotel Bristol (northwest corner of Boylston and Clarendon). 13 Hereford was not listed in the 1880 and 1881 Blue Books. By the 1881-1882 winter season, 13 Hereford was the home of Ebenezer Dale, Jr., a dry goods merchant and textile mill operator, and his wife, Lydia Jackson (Storrow) Dale. They had married in November of 1880. Before their marriage, he had lived with his widowed mother, Caroline (Young) Dale, at 111 Beacon. 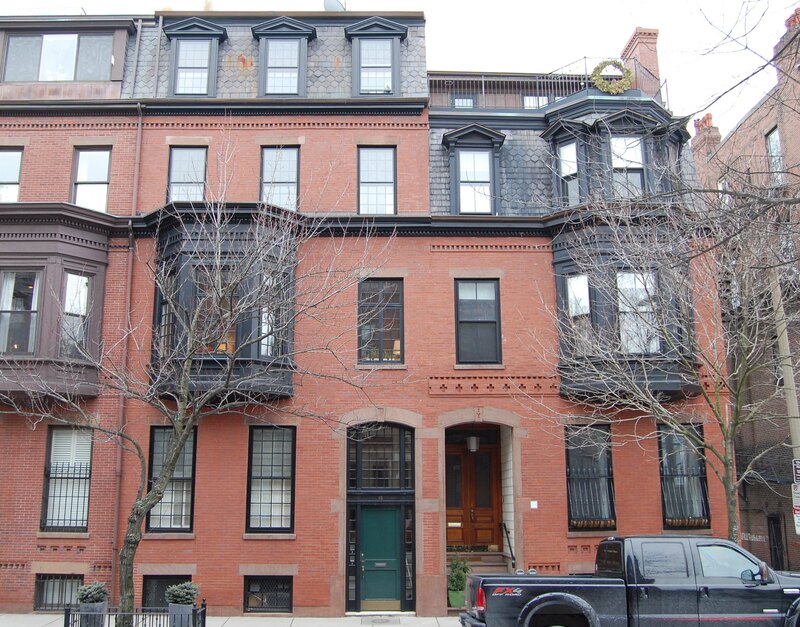 Lydia Storrow had lived at 192 Beacon with her parents, Charles Storer Storrow and Lydia (Jackson) Storrow. Eben and Lydia Dale also maintained a home at Fresh Water Cove in Gloucester. On May 23, 1882, Charles S. Storrow purchased 13 Hereford from Marion Morse. The Dales continued to live at 13 Hereford during the 1888-1889 winter season. On August 13, 1889, Charles Storrow sold 13 Hereford to Edward B. Russell. Ebenezer Dale, Jr., died in September of 1889, having committed suicide at the Dales’ home in Gloucester. Soon after his death, Lydia Dale moved back to 192 Beacon to live with her recently-widowed father. 13 Hereford was not listed in the 1890 Blue Book. On September 11, 1890, 13 Hereford was acquired from Edward Russell by Caroline (Luce) Walter, the wife of banker and broker Howard Walter. They previously had lived at 66 Mt. Vernon. Howard Walter died in November of 1891. Caroline Walter continued to live at 13 Hereford during the 1892-1893 winter season, and then moved to Newport to live with her parents, Admiral Stephen Bleeker Luce and Eliza (Henley) Luce. During the 1893-1894 winter season, 13 Hereford was the home of architect William York Peters and his wife, Amey Dexter (Sharpe) Peters. They previously had lived at the Hotel Brunswick (southeast corner of Clarendon and Boylston). 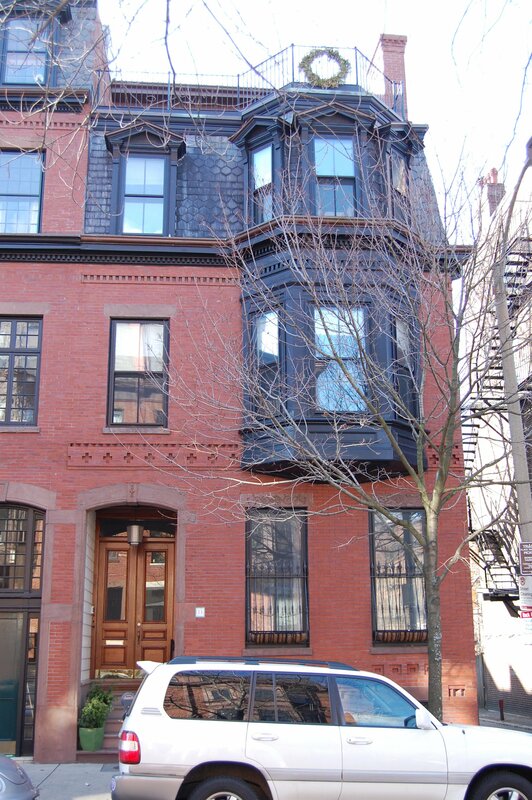 By the 1894-1895 season, William and Amey Peters had moved to 8 Chestnut and 13 Hereford was once again Mrs. Walter’s home. She continued to live there during the 1895-1896 season, but moved thereafter to Newport. Caroline Walter continued to own 13 Hereford and lease it to others. She married again, in October of 1908, to Montgomery Meigs Macomb, a Colonel and later a Brigadier General and president of the Army War College. After their marriage, they lived in Washington DC. By the 1896-1897 winter season, 13 Hereford was the home of Dr. Mark Wyman Richardson and his wife, Josephine (Lord) Richardson. They had married in February of 1895, after which they lived in Europe, where he studied in Berlin, Vienna, and Dresden. Dr. Richardson was a physician and also maintained his offices at 13 Hereford. His brother-in-law, Dr. Sidney Archer Lord, also a physician, also maintained an office there. Sidney Lord lived at 20 Brimmer, where he had another medical office. By the 1898-1899 winter season, Sidney Lord had consolidated his home and office at 20 Brimmer, and Dr. James Savage Stone, a physician, was living with the Richardsons and maintaining his medical practice there with Dr. Richardson. He previously had lived and maintained his office at 61 Chestnut. James Stone had been a classmate of Mark Richardson at Harvard. 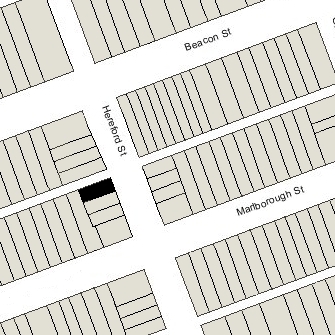 By 1900, the Richardsons had moved to 14 Everett, and Dr. Stone had moved to 146 Marlborough and then to 125 Marlborough, and by the 1901-1902 winter season was living at 234 Marlborough. 13 Hereford was not listed in the 1900 Blue Book. By the 1900-1901 winter season, 13 Hereford was the home of Florence L. (Clarke) Cruft. the widow of Charles F. Cruft. He had been auditor and general ticket agent for the St. Paul and Duluth Railway until his death in 1880. She previously had lived at 44 Highland in Roxbury. Their unmarried daughters, Eunice and Frances, lived with her. They continued to live there in 1904, but had moved to 7 Hereford by 1905. By the 1904-1905 winter season, 13 Hereford was the home of Edward Sherwin and his wife, Helen Goddard (May) Sherwin. They had been married in May of 1904, and 13 Hereford probably was their first home together. Edward Sherwin was New England agent for the Philadelphia and Reading Coal and Iron Company. They continued to live at 13 Hereford until his death in September of 1907. By the 1907-1908 winter season, 13 Hereford was the home of Winthrop T. Hodges and his wife, Helen Gordon (Wallace) Hodges. They previously had lived at The Empire at 333 Commonwealth. They also maintained a home in Nahant. Winthrop Hodges was United State Appraiser for the customs service. The Hodges continued to live at 13 Hereford during the 1912-1913 season, but moved thereafter. 13 Hereford was not listed in the 1914 Blue Book. By the 1914-1915 winter season, it was the home of Sarah (Mason) Derby, widow of Dr. Hasket Derby, an oculist and ophthalmologist, and their daughter, Eloise Lloyd Derby. Hasket Derby had died in August of 1914; before his death, they had lived in Milton and, before that, at 352 Beacon. Sarah (Mason) Derby was the sister of Dr. Amos Lawrence Mason, who married Louisa Steedman, daughter of Rear Admiral Charles Steedman and Sarah (Bishop) Steedman, who lived at 13 Hereford shortly after it was built. From about 1917, Eloise Derby was in France, working with the Red Cross. After the war, she lived in Paris. On January 11, 1921, Caroline (Luce) Walter Macomb sold 13 Hereford to Edward Fiske of Weston. On March 6, 1921, it was acquired from him by his first cousin, Charles Henry Fiske, Jr., an attorney. On March 22, 1922, it was acquired from Charles Fiske by investment banker Guy Warren Walker. And on March 2, 1923, it was acquired from Guy W. Walker by Dr. Charles L. Overlander, a physician, who lived and maintained his offices at the Van Courtland apartments at 520 Beacon. Sarah Derby continued to lease 13 Hereford through the 1922-1923 winter season, but had moved to 383 Marlborough by 1924. On August 23, 1923, 13 Hereford was acquired from Charles Overlander by Alice Davis (Field) Hubbard, the wife of real estate dealer Charles Joseph Hubbard. They previously had lived in Milton, where they continued to maintain a home in the Readville district. They also maintained a home in Petersham, Massachusetts. 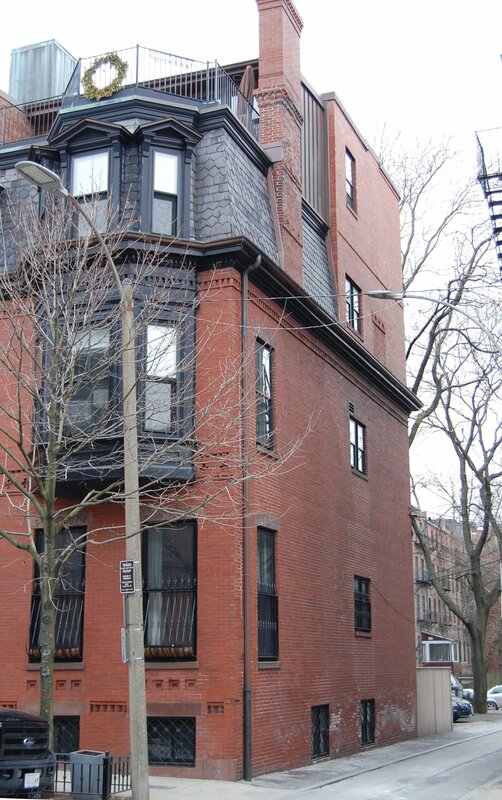 The Hubbards lived 13 Hereford during the 1924-1925 season, but moved thereafter to The Charlesgate at 535 Beacon. Alice Hubbard continued to owner 13 Hereford and lease it to others. During the 1925-1926 winter season, 13 Hereford was the home of Joseph Rochemont Hamlen and his wife, Martha (Thorndike) Hamlen. They previously had lived in Little Rock, Arkansas, where he had been vice president of a lumber company; he later would become an advertising executive. They moved by the next season and by 1930 lived in Brookline. During the 1926-1927 winter season, 13 Hereford was the home of Mrs. Marguerite (Gray) Swann, widow of John Butler Swann. Their adult children — John Butler Swann Jr., Helen E. Swann, Howard G. Swann, and Marguerite Swann — lived with her. They previously had lived in Milton and by the next season had resumed living there. During the 1927-1928 winter season, 13 Hereford was the home of Josiah Robinson Harding, a retired cotton manufacturer, and his wife, Jessie Campbell (Ware) Harding. They previously had lived at 311 Marlborough. They also maintained a home at Marblehead Neck. They continued to live at 13 Hereford during the 1928-1929 season, but moved soon thereafter to Brookline, where Josiah Harding died in October of 1930. Charles and Alice Hubbard resumed living at 13 Hereford during the 1929-1930 winter season. Alice Hubbard died in September of 1930 and Charles Hubbard moved soon thereafter to their home in Readville; he died in March of 1931. During the 1930-1931 winter season, 13 Hereford was the home of Edward Eells Franchot and his wife, Harriette DuBois (McKnight) Franchot. He was an attorney in Niagara Falls, New York, which was their permanent residence. They probably were in Boston because of the wedding of their son, Stanislas Pascal Franchot, a junior at Harvard, whose intended marriage to English actress Fanchia Forbes-Robinson Hale was announced in March of 1931. When they acquired 13 Hereford in 1923, the Hubbards had assumed a mortgage that Edward Fiske had entered with the Suffolk Savings Bank for Seamen and Others when he bought the house in 1921. On October 6, 1932, Howard R. Brentlinger, the assignee of that mortgage, foreclosed and sold the property to John A. McNamara, a real estate manager. The house was not listed in the 1932-1936 Blue Books, and was shown as vacant in the 1932-1934 City Directories. On October 26, 1932, 13 Hereford was acquired from John McNamara by Bertella Marie (Wright) Hersey, the former wife of Elmer Pierce Hersey. On December 2, 1932, the house was acquired from Bertella Hersey by Bertha Reutter. On February 6, 1933, 13 Hereford was acquired from Bertha Reutter by Miss Jane McLosky. The February 23, 1933, Boston Globe article on the sale indicated that she would improve the property by installing “converting the house into four up-to-date two-room and kitchenette apartments.” In March of 1933, she filed for (and subsequently received) permission to convert 13 Hereford from a single-family dwelling into five apartments. She subsequently abandoned the permit. On July 13, 1933, the Suffolk Savings Bank for Seamen and Others foreclosed on its mortgage to Bertella Hersey and took possession of 13 Hereford. In August of 1943, it filed for permission to convert the property from a single-family dwelling into four apartments. The permit application was subsequently abandoned. 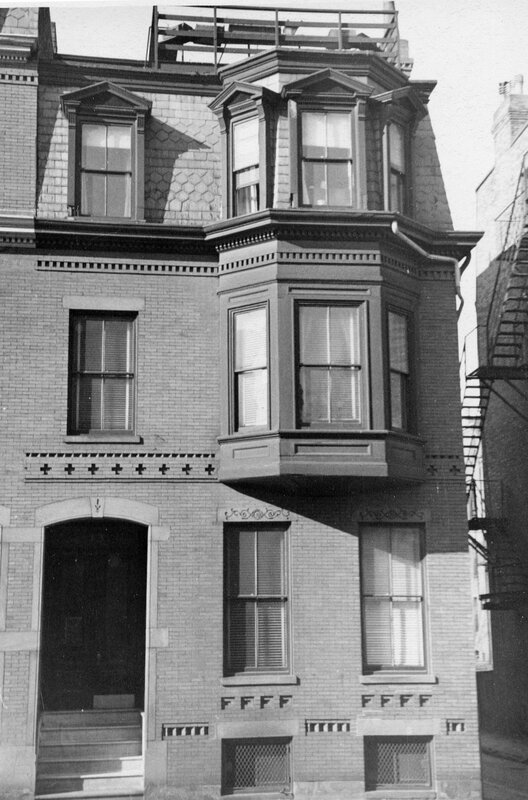 In December of 1933, John A. McNamara, presumably acting for the bank, filed for (and subsequently received) permission to convert the property into five apartments. On May 29, 1940, 13 Hereford was acquired from the Suffolk Savings Bank by Miss Beatrice Antonetta Bortone, one of eight Back Bay properties she acquired from the bank at the same time. She was a bookkeeper with Leopold Morse & Co., wholesale and retail clothiers. She lived in Wayland with her parents, Anthony C. Bortone and Maria (Larocca) Bortone. In 1946, she married Albert DeStefano. After their marriage, they lived in Newton. On Augustus 28, 1957, 13 Hereford was acquired from Beatrice (Bortone) DeStefano by real estate dealer Overton W. Oglivie, who also acquired most of her other Back Bay properties on the same day. On March 6, 1958, 13 Hereford and several other properties were acquired from Overton Ogilvie by Charles M. Rhodes. Five days later, the properties were acquired from him by real estate dealer and future hotel owner Isaac M. Saunders and his sons, Roger A. Saunders and Donald L. Saunders. On March 19, 1959, Charles W. Easter acquired 13 Hereford from the Saunders family. He was vice-president of Fitz-Allen Auto Parks, Inc., operators of parking lots. On January 29, 1962, 13 Hereford was acquired from Charles Easter by Frederic Alan Sharf. On December 2, 1963, 13 Hereford was acquired from Frederic Sharf by Norman William White and his wife, Adele Marilyn (Krous) White, of Waban, and Murray Herscott (Herscovitz) and his wife, Norma (Averback) Herscott, or Lexington. Norman White was president and treasurer of the General Envelope Company, and Murray Herscott was an accountant. On June 10, 1965, 13 Hereford was acquired from the Whites and the Herscotts by Berthe L. Lessard, employed with the Craftsman Life Insurance Company, who lived in one of the apartments. She previously had lived in an apartment at 580 Commonwealth. On December 30, 1970, 13 Hereford was acquired from Berthe Lessard by the Wig Wam Wig Corporation (George Santomeno, president and treasurer). On May 16, 1977, William J. Doran purchased 13 Hereford from the Wig Wam Wig Corporation. In October of 1977, he applied for (and subsequently received) permission to extend the existing partial fourth floor over the remainder of the roof (which previously had been a deck). In October of 1988, he applied for (and subsequently received) permission to convert the property from five to three apartments. In September of 1996, he applied for (and subsequently received) permission to convert the property from three apartments into a single-family dwelling. Although the permit was approved, it appears that he subsequently abandoned it. On September 29, 2005, 13 Hereford was purchased from the Spitzers by Douglas M. Cummings, Jr., and his wife, Stacy D. Cummings. On November 21, 2006, 13 Hereford was purchased from the Cummings by Laurie J. Hall, trustee of the Thirteen Hereford Realty Trust. In March of 2007, the trust filed for (and subsequently received) permission to convert the property into a single-family dwelling. On July 14, 2016, 13 Hereford was acquired from Becky Kidder Smith, successor trustee of the Thirteen Hereford Realty Trust, by the 13 Hereford Street LLC (Robert Sherwood, manager of record). 13 Hereford remained a single-family dwelling in 2017.